If you've waited until the last minute to do your gift shopping, send gourmet cheesecake gifts overnight to recipients all over the country. 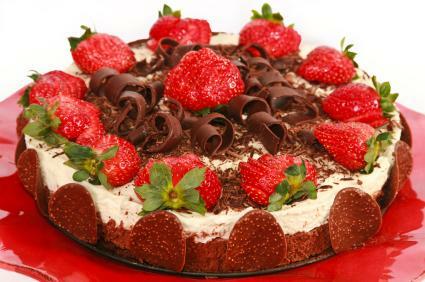 Cheesecake is rich, decadent and can be delivered in 24 hours after time of purchase. Food sends a message that you care. Gourmet food has no size restrictions or color preferences to watch for. Gourmet food transcends ordinary gifts with a level of visual perfection as well as outstanding taste. Gourmet cheesecake gifts and others like them can be shipped right to the recipient within 24 hours, making them perfect for last minute additions to the guest list. Cheesecake is rich, creamy dessert all on its own, when it's been stepped up to gourmet standards, there is nothing that can compete with it. But what makes a cheesecake gourmet instead of ordinary? Gourmet foods, including cheesecakes, use nothing but the finest ingredients. Gourmet cheesecakes are made with fresh cream cheese and mascarpone, real vanilla bean and butter with nothing artificial about them. Vanilla cheesecake with a fruit topping is a fairly traditional dessert. Gourmet cheesecakes step it up to the next level, with fruit baked inside, nuts, dark chocolate and unusual flavor combinations. Chocolate cookie crusts and flavors like key lime blackberry swirl and lemon raspberry make these cheesecakes something special. If fruit isn't your idea of a cheesecake topping, what about chocolate bark, amaretto syrup or chocolate cover almonds? Gourmet cheesecakes come flavored inside and out for a perfect look and taste. Looking for a heart shaped cheesecake to send to a loved one? What about cheesecakes mounted on sticks for a whimsical touch? Gourmet cheesecakes don't just come in the shape of a pie anymore. A gourmet cheesecake should be purchased and sent the day before or two days before it is actually required. Since cheesecakes do best refrigerated, they should be shipped overnight or second day with a cool pack. Most companies will ship the same day they are ordered, but planning ahead and specifying the day you would like it be delivered is never a bad thing either. Decadence Gourmet Cheesecakes - The perfect gift for offices, Decadence Gourmet offers cheesecakes baked right inside a glass jar, perfect for individual servings, or taking home. Harry and David - One of the most recognized names in gourmet food gifts, Harry and David offer free overnight shipping on many of their cheesecakes. Gourmet Gift Baskets - These cheesecakes are shipped overnight anywhere in the country, making sure your last minute gift arrives on time. Giving gourmet cheesecake as a gift is sure to please everyone on your gift list. There are few people out there that will turn away cheesecake, and these gourmet cakes will ensure that no one will want to.